Check Out The New Trailer for ‘Jack and the Giant Slayer’!!! Here is the newest trailer of ‘Jack The Giant Slayer‘ from Warner Bros. I’ve been eagerly awaiting this film for a while now, and it looks epic as well as a lot of fun. Bryan Singer is directing with Nicholas Hoult starring as Jack. He is joined by Ewan McGregor, , Stanley Tucci, Warwick Davis, Bill Nighy, Ian McShane, Eleanor Tomlinson and Eddie Marsan. Official Synopsis: “Jack the Giant Slayer” tells the story of an ancient war that is reignited when a young farmhand unwittingly opens a gateway between our world and a fearsome race of giants. Unleashed on the Earth for the first time in centuries, the giants strive to reclaim the land they once lost, forcing the young man, Jack (Nicholas Hoult) into the battle of his life to stop them. Fighting for a kingdom, its people, and the love of a brave princess, he comes face to face with the unstoppable warriors he thought only existed in legend-and gets the chance to become a legend himself. Enjoy the trailer and the film opens up March 1st. 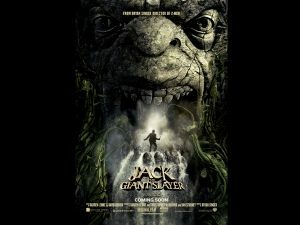 Film Review: ‘Jack the Giant Slayer’!!! This entry was posted on Wednesday, February 13th, 2013 at 12:05 pm	and is filed under Film, News. You can follow any responses to this entry through the RSS 2.0 feed. You can skip to the end and leave a response. Pinging is currently not allowed. « Nic Cage Set to Star in New Film Made for Nic Cage!! In the Olympics, yes. On channel 23, no.